Vegan soups make it easy to stay hydrated and eat more veggies-- two things that are hard to do in winter months. Plus, since you can make a big pot of soup using inexpensive, (mostly) unprocessed whole foods, vegan soups can help you to save money on groceries and take out while you spend less time cooking. Pictured: Secret Weapon Purple Miso Soup, Spicy Pumpkin Chili, Curry Cauiflower with Spinach Soup, Blender Borsch, and Spiced Red Lentil Tomato Kale Soup. The first day of the 2016 guided group challenge is Sunday, February 7, 2016. The last day of the guided group challenge is Saturday, February 27, 2016. Here are recipes I featured during last year's challenge. They were selected because they all include nutrient-dense whole foods. Many also include orange root veggies, healthy fats, and protein-- three important factors in reducing cravings for unhealthy sweets. Want more recipes? Did you know there is an entire book of vegan soup recipes? Yep, one of my favorite veg cookbook authors, Nava Atlas, published Vegan Soups and Hearty Stews for All Seasons. This might be helpful to those of you who prefer to cook with an open book (instead of a tablet or other device). This was one of my favorites: Coconut Curry Soup. I enjoyed it with quinoa and side of curry tempeh. What's your favorite vegan soup recipe? Leave a link to the recipe in the comments. 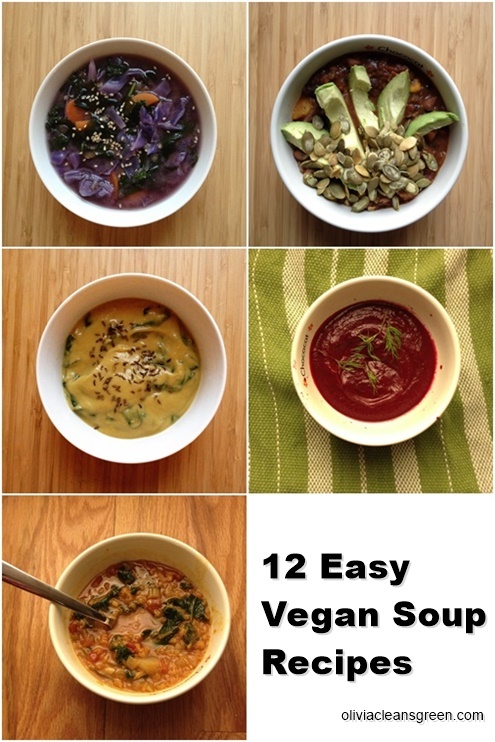 Are you participating in the guided 21 Day Vegan Soup Challenge this February? Get all the info here. We'll be enjoying a whole new set of selected recipes during the challenge! Olivia Lane Lovejoy is a Blogger, Green Living Educator, and Health Coach trained at The Institute for Integrative Nutrition. She's also author of Baking Soda & Bliss: The Healthy & Happy Guide to Green Cleaning.